If your strawberries are fresh and rip, then cut 1 hour before placing on cake, otherwise cut 2 – 3 hours before. Cut lengthwise in halves or quarters, and place in large dish. Sprinkle with sugar. Set aside for the allotted time. 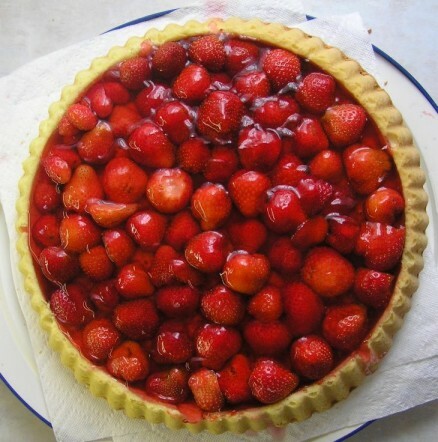 Line the cake shell with strawberries, oerlapping at the bottoms to cover the crust completely. Glaze: Cook the first three ingredients until the mixture becomes thick. remove from heat and add gelatin immediately, while continuously stirring. Stir until smooth. Pour the glaze over the strawberries being careful to not allow too much to spill over the sides. Make sure the berries are covered completely. Ready to serve in about an hour, or until glaze is fully set. If keeping longer than a day or two, refrigerate, or the berries may begin to mold. Serve with whipped cream. Hello, I just wanted to know if we could use anything to make a torte like Shokolade, or orgentorte. you know, something other than strawberries? If you could give the full recipe like how to layer it and things like that I would really apprieciate it. Hi, Briana! Germans would not use this for chocolate at all. If you want to do a different fruit, such as oranges, I would recommend using canned mandarin oranges. Make sure they are drained well. You could even use the juice to make an orange gelatin, as above stated. Simply replace a portion of the water in the glaze with the syrup/juice, and use orange gelatin. Now if you would like to do it all from scratch, you can use the recipe here and simply substitute your fruit. But again, this torte is only a fruit based recipe. I can try to put together a typical German chocolate cake recipe in the next few days and post it. Hope this helps! Growing up with a native German neighbor, she would also make this with canned sliced peaches and pears in the winter. Instead of gelatin, she used vanilla pudding and cooked it with the canned fruit juices instead of milk. She started the top by placing a marachino cherry in the center. Thank you for the lovely recipe. I needed to make an Erdbeerkuchen for a friend, and this worked perfectly and was received with much appreciation. Thank you! You can use any kind of canned fruits for these cakes,just make sure they are drained well.